With Halloween just days away, this is the perfect time to binge some frightening fare on Netflix. Thankfully, the streaming service has a number of Hindi horror films to keep you spooked all weekend long. Before we dive into Bollywood, allow me to mention some spectacularly scary Korean movies that are also worth checking out. Netflix has my absolute favorite horror film, The Wailing, as well as the terrific zombie thriller Train to Busan and the gut-wrenching monster movie The Host. If you’ve ever wanted to hop on board the K-drama bandwagon, start with the 16-episode TV series Oh My Ghost (aka “Oh My Ghostess“) — a funny and surprisingly touching story of a timid prep cook possessed by the spirit of a horny virgin ghost. Onto the Hindi horror films on Netflix! Sharma Joshi plays an exorcist tasked with removing an ancient Rajasthani curse from a London couple in the third film in the 1920 series. This time, Akshay Kumar is an exorcist who must displace the vengeful spirit of a court dancer from Vidya Balan. Balan’s performance in the thrilling climactic dance number is worth the price of admission, in my book. A boy befriends a cantankerous old ghost, played by Amitabh Bachchan. A nice family comedy with a weirdly specific moral message. This scary tale of college students trapped in haunted hotel is based on the Stephen King short story “1408“, which spawned a movie of the name starring John Cusack and Samuel L. Jackson in 2007. The talented Swara Bhaskar of Nil Battey Sannata fame headlines this story of spiritual possession in a struggling factory town. This entry was posted in Streaming Video and tagged 1920 London, 2017, Bhool Bhulaiyaa, Bhoothnath, Bollywood Horror Movies on Netflix, Bollywood Movies on Netflix, Desi Movies on Netflix, Hindi Movies on Netflix, Horror Story, Indian Movies on Netflix, Macchli Jal Ki Rani Hai, Machhli Jal Ki Rani Hai, Oh My Ghostess, Streaming Video, The Host, The Wailing, Train to Busan on October 27, 2017 by Kathy. Kal Kissne Dekha is a movie about a young man with a special power: the power to bore an audience to tears by relying on Bollywood cliches. The young man in question is Nihul (Jackky Bhagnani), a country boy who can see the future. He leaves his lonely, heartbroken mother and heads to a university in the city to become a scientist. As is the case in many Hindi films these days, Nihul is supposedly the most awesome guy ever. He doesn’t do anything to warrant this status; it’s simply that he’s the protagonist and the plot demands it. However, there’s a group of cool kids at college who don’t like the flashy newcomer. The mean guy and the snobby girl pick on Nihul until his psychic ability allows him to save their lives. Only then do they realize how fabulous Nihul really is. In between motorcycle chases, fight scenes and dance numbers, Nihul falls in love with the snobby girl, Nisha (Vaishali Desai). Not for any good reason, mind you, but because the plot demands it. Then the requisite gangsters, gay stereotypes, terrorists and incompetent policemen show up, just to make sure no Bollywood cliche is left behind. It’s as though the film was written by checking items off of a list. 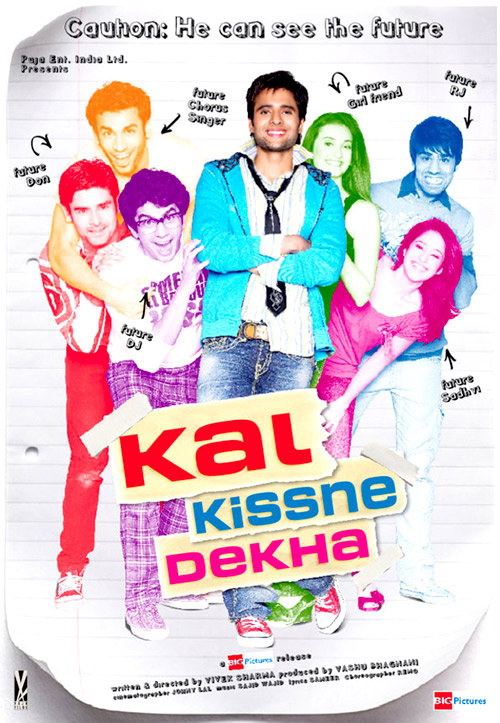 Kal Kissne Dekha is writer-director Vivek Sharma’s second effort, following last year’s forgettable Bhoothnath. I’d appreciate it if he’d stop making movies, and not try to see if the third time is the charm. Sharma’s storytelling style insults the audience’s intelligence by relying on cliches and stunts in place of even the barest hint of character development. And he shamelessly includes two of the young stars of Slumdog Millionaire in brief cameo appearances in order to capitalize on their fame. If Sharma insists on writing and directing more movies, he needs to abandon two themes present in both of his efforts to date. First is the notion that the only route to popularity is by using a supernatural ability to save someone. In Bhoothnath, the young protagonist relies on his ghostly pal to pull the school bully out of a well, thereby winning the bully’s friendship. As a moral to a story, it’s a pretty depressing one for those of us without superpowers. The second bizarre theme is that disaster befalls those who dare move out of their parents’ homes. It’s blatant in Bhoothnath, but it also crops up in Kal Kissne Dekha, as when Nihul tells his mother, “I never should have left home.” It’s a conservative message that doesn’t mesh with the fact that, by moving to the city, Nihul gets to study science, make friends and meet his girlfriend — stuff he couldn’t have done in his small village. This entry was posted in Reviews and tagged 2009, Bhoothnath, Bollywood, Hindi, Jackky Bhagnani, Kal Kissne Dekha, Movie Review, Slumdog Millionaire, Vaishali Desai, Vivek Sharma, Zero Stars on June 13, 2009 by Kathy.